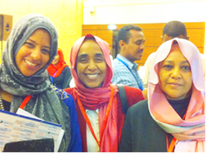 Sudan Medical Council (SMC) has been awarded Recognition Status by the World Federation of Medical Education (WFME). 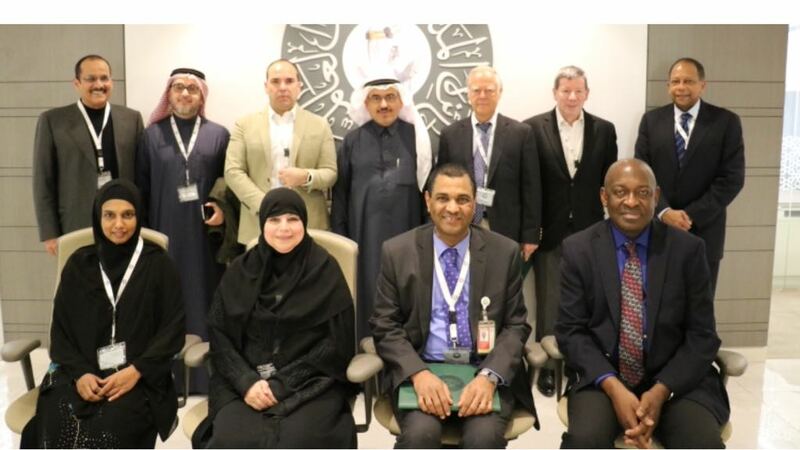 The Recognition SMC is the tenth accrediting agency that has received the WFME Recognition Status worldwide, and the first in both the Arab and African countries (http://wfme.org/news/sudan-medical-council-smc-awarded-recognition-status/) . Professor Zein A. Karrar (Photo) has been the President of SMC since 2009 (https://m.youtube.com/watch?v=QG5d150bRWI). 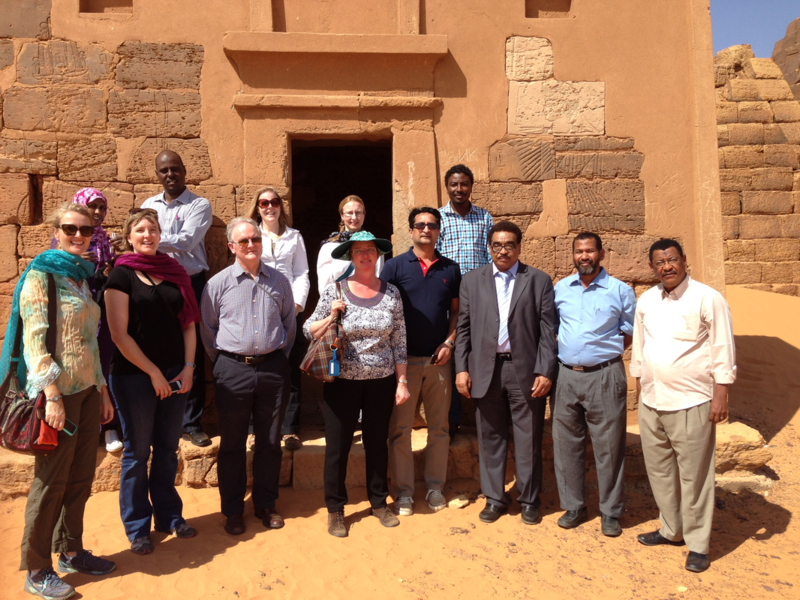 He is also Ex-President of the Sudan Association of Paediatricians, and is currently Member of the Editorial Board of the Sudanese Journal of Paediatrics. 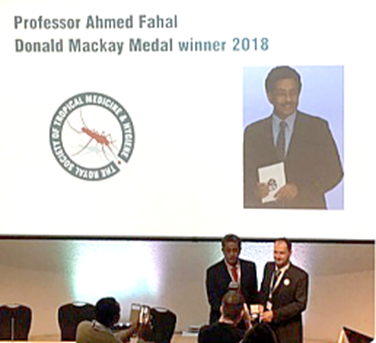 Professor Ahmed Fahal was awarded the prestigious Donald Mackay Medal. The medal is awarded annually, in alternating years by the Royal Society of Tropical Medicine and Hygiene and by the American Society of Tropical Medicine & Hygiene. The award is for outstanding work in tropical health, especially relating to improvements in the health of rural or urban workers in the tropics. 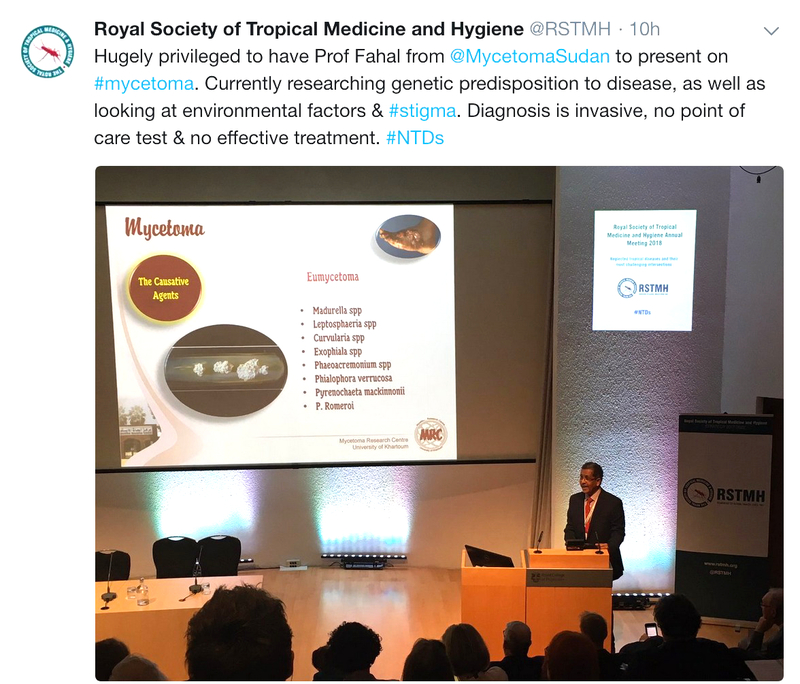 Professor Ahmed delivered a plenary talk (Photos) and received his award at Royal College of Physicians of London during the Annual Meeting of the Royal Society of Tropical Medicine and Hygiene, 19-20 September 2018. His outstanding clinical and research work focused on mycetoma which has grave socioeconomic consequences. Children drop out of school and their peer group, and young adults cannot finish their training or find a job or a spouse. In celebration of its 500th anniversary, the Royal College of Physicians (RCP) has appointed a Quincentennial Lecturer in each region of the UK. 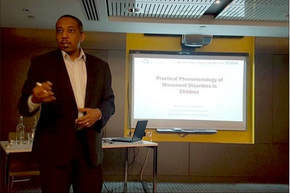 Dr Ahmed Hashim was chosen by the RCP to deliver the Quincentennial lecture for London and South East Region. On Monday, 30 April 2018 he presented his work (Photo, right) which was attended by Professor Jane Dacre, RCP President (Photo, left). 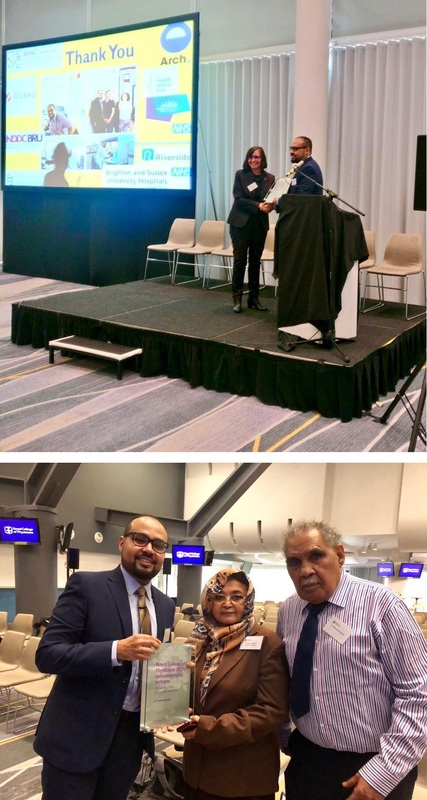 Dr Ahmed Hashim is the son of Dr. Mohamed Sir Elkhatim Hashim (Photo, right; Member of the Editorial Board of the Sudanese Journal of Paediatrics, and Ex-President of the Sudan Association of Paediatricians). 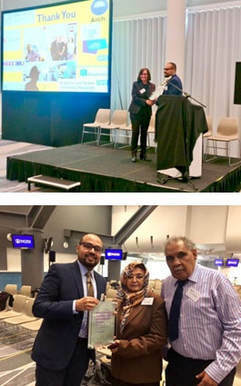 His mother Dr Nawal Elkurdufani (Photo, middle; Consultant Cardiologist and Ex-President of the Sudan Association of Physicians) received in 2017 the RCP Excellence in Patient Care Award. 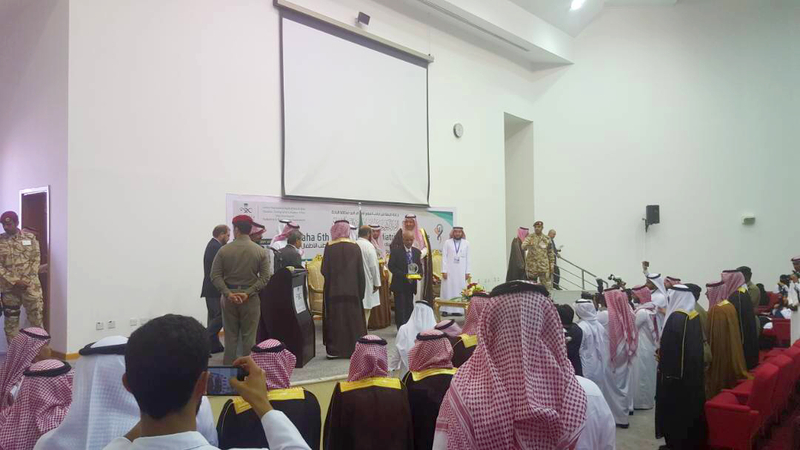 Dr. Satti Abdulrahim Satti, Ex-Editor of the Sudanese Journal of Paediatrics, Ex-President of the Sudan Association of Paediatricians , and Dean Faculty of Medicine, AlMughtaribeen University, Khartoum State, Sudan was honored By Prince of Al-Baha Region, Prince Dr. Hossam bin Saud bin Abdulaziz Al Saud, as part of the activities of Al-Baha 6th International Pediatric Conference (28-30 November 2017). 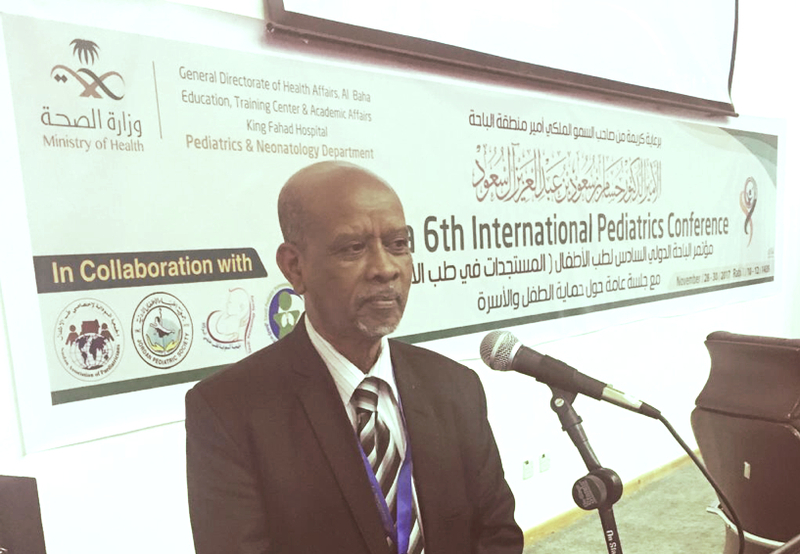 This appreciation and tribute to Dr. Satti is for being President of the Sudan Association of Paediatricians and also as being one of the pediatricians who established the Pediatrics Department of the King Fahad Hospital, Al-Baha, serving for several years before returning to Sudan. To learn more click here. 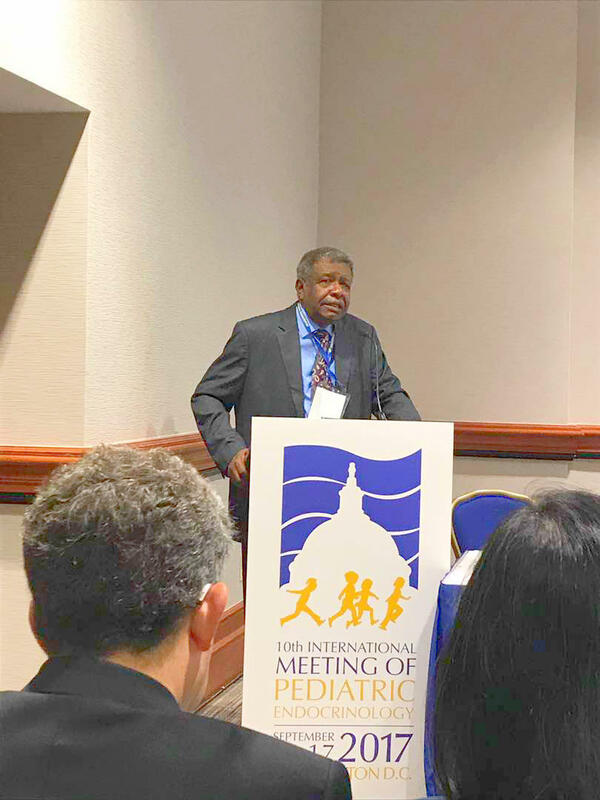 Professor Mohammed Ahmed Abdullah, Ex-President of the Sudan Association of Paediatricician has been honored during The 10th International Meeting of Pediatric Endocrinology (the largest global gathering of more than 4,000 Pediatric Endocrinologists from over 100 countries) which convened in Washington D.C., USA from 14-17 September 2017. 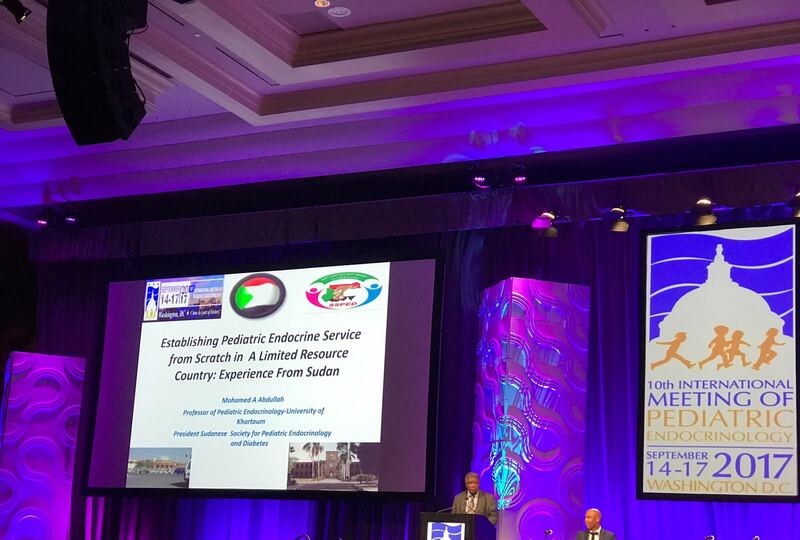 He delivered an invited plenary session talk on his pioneering experience in establishing a comprehensive pediatric endocrinology service in resource limited settings. 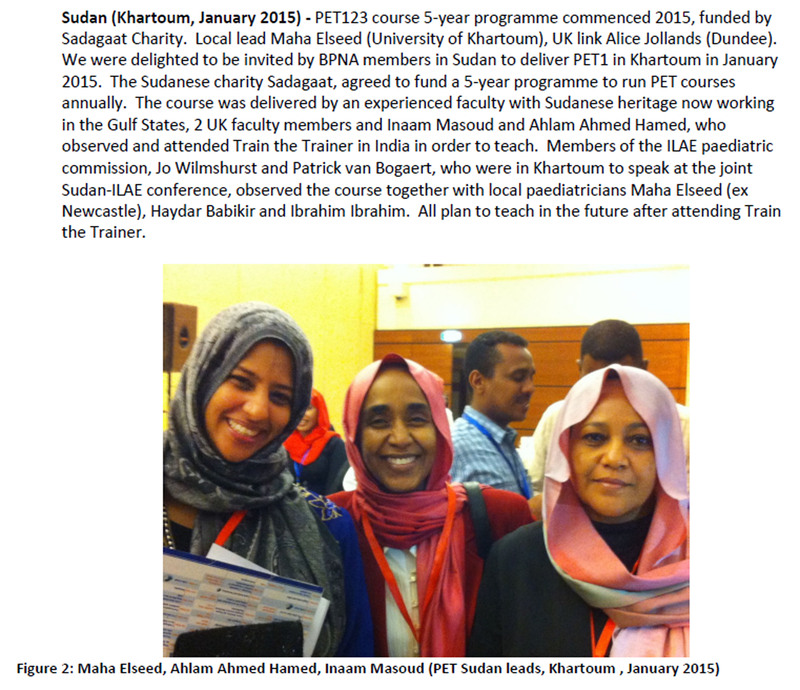 The BPNA 2014- 2015 Annual Report highlighted the new partnership model of the international Paediatric Epilepsy Training (PET) programme, first launched in Sudan and India. 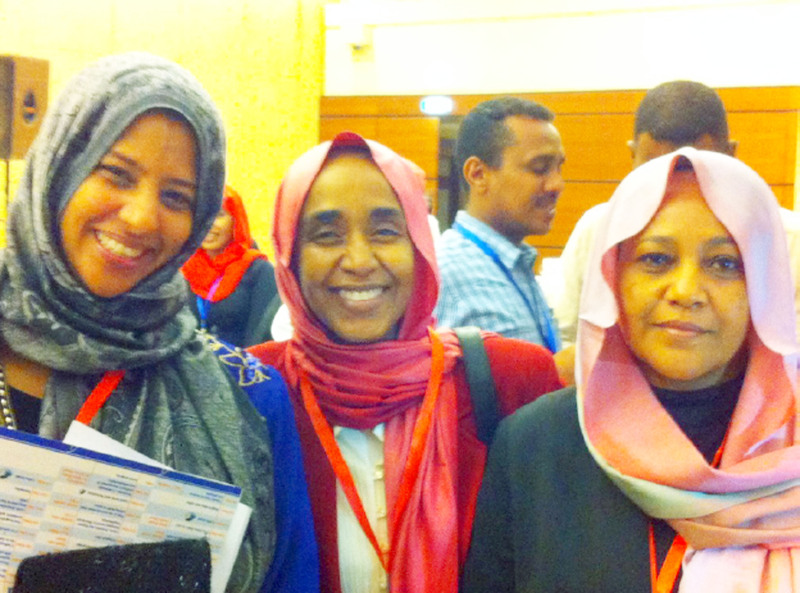 Dr Maha A. Elseed, Dr Ahlam A. Hamed and Dr Inaam N. Mohammed (photo: left to right) were featured in the Report, having acted as PET Sudan leads. 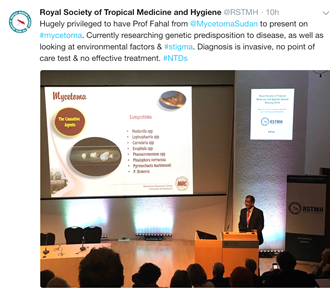 ​Mycetoma has been overlooked by global health authorities for a considerable period. In Sudan, the socioeconomic consequences are grave: children drop out of school and their peer group, and young adults cannot finish their training or find a job or a spouse. 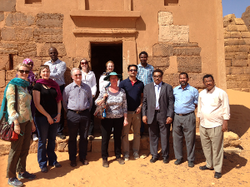 In January 2016, the Executive Board of the WHO endorsed adding mycetoma to the neglected diseases list. 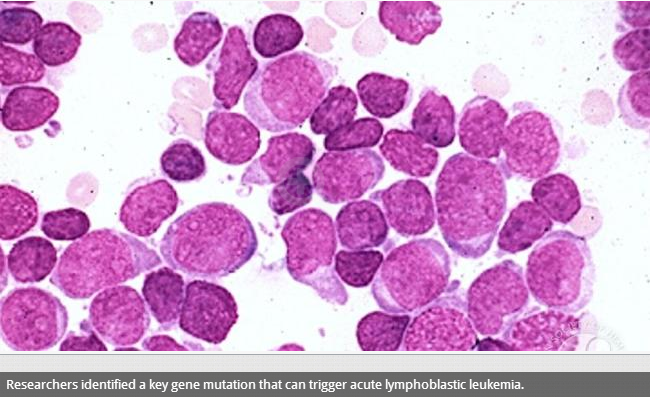 Final approval by the World Health Assembly meeting in May 2016 will pave the way for funding organizations to support the much-needed epidemiologic and other research. The photo shows Prof. Ahmed Fahal (right), Director of the Mycetoma Research Center, University of Khartoum and Nathalie Strub Wourgaft (left), of the Drugs for Neglected Diseases initiative, examining a patient. To learn more click here. 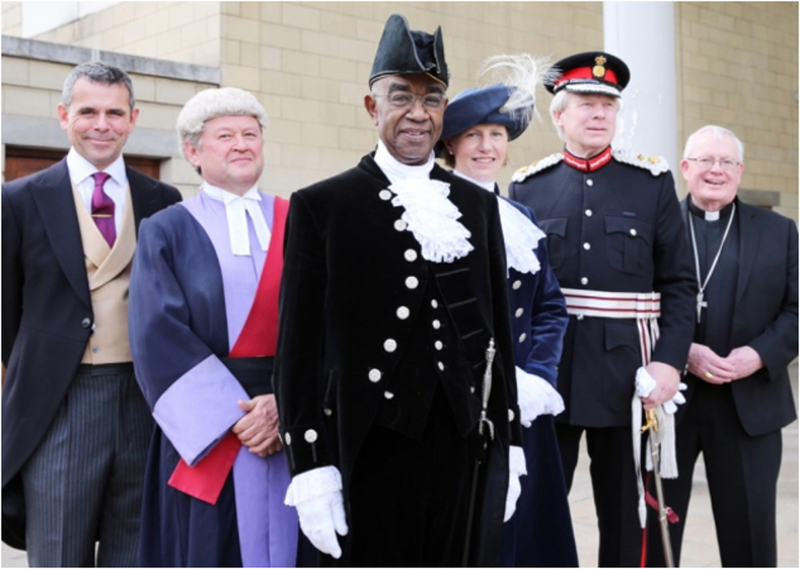 ﻿Dr Ahmed Ibrahim Mukhtar, Sudanese Paediatrician who has been medical director at Kettering General Hospital for eight years, was appointed High Sheriff of Northamptonshire, United Kingdom (UK) in the spring of 2015. Dr Ahmed I. Mukhtar, who spent over 40 years working in medicine, is a member of the International Editorial Board of the Sudanese Journal of Paediatrics (SJP). He graduated from the Faculty of Medicine, University of Khartoum (U of K) and has been the President of the U of K Medical Students Union. He has also served for a number of years on the governing council of University College Northampton and its successor the University of Northampton, UK. To learn more click here. Mycetoma constitutes a serious health problem with high morbidity in endemic subtropical areas leading to severe deformity and disability both in children and adults. 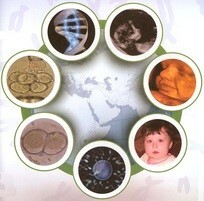 The disease has recently been recognized by the WHO as a neglected tropical condition. Strabismus is misalignment of the eyes which affects about 3% of children. If left untreated, it causes vision loss due to amblyopia in about 50% of cases and results in a significant adverse cosmetic effect. To treat strabismus, the eyes are aligned surgically when nonsurgical methods are unsuccessful. Other than the plan of surgery, the most challenging task in strabismus surgery is proper suturing of the eye muscles. A simple and efficient way to do that has been developed in Omdurman, Sudan. To learn more click here. The African quinine versus artesunate malari﻿a ﻿trial (AQUAMAT) has now proved that parenteral artesunate is superior to quinine in children with severe malaria. The AQUAMAT trial represents the largest trial on hospitalized patients with severe malaria ever completed, with 5425 patients, equally divided in two treatment groups exposed to artesunate and quinine, respectively. For details click here.